Talking about serverless microservices, functions are the basic building blocks of the service functionality. How to design them from the code and deployment perspektive? Let's simply define a microservice as an autonom service built from one or more resources. 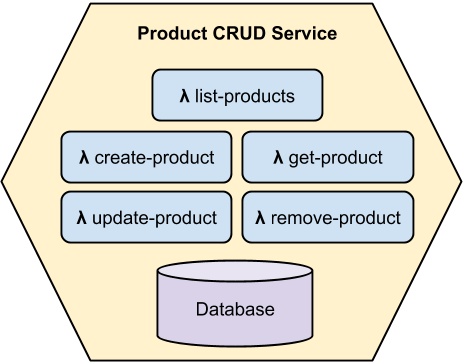 The resource mean functionality (functions*), storage (database), communication (message topic), etc. All the service needs must be included in the stack or given as a parameter (environment variable), API is exposed and besides are all the resource private for the microservice. One microservice ⇔ one stack ⇔ one deployment pipeline. How does this look like from the dev-ops point of view? We can create a new project artifact for every function. Such code is easy to reason about, easy to test and deploy. The last one could be written with a question mark, of course it's easy to deploy a function, but don't forget there must be pipeline actions for build, deploy and test execution which is really only doing, but it's a strenuous and boring job and brings additional complexity. As you can see there several files only to set up the module. This must be multiplied for every function. So, a function for an action sounds well in theory but in practise it could be an overkill. Decoupling is propably the most important concept in the design of software systems. So we never surrender this principle. Anyway we can distinguish between logical and physical coupling. Two modules can be perfectly decoupled even while physically existing in a same artifact - when they have no shared code and dependencies only to APIs (following principles of hexagonal architecture). The Single Responsibility Principle is applied here. The function has its own handler which takes care of the incoming HTTP request. All the HTTP-related checks and transformations must be done here. The handler is the only one place for such a dirty code. After the request is checked, dispatching is executed. This is something like a main method, an entry point to the business logic. In this case just getting the product details. The actions are decoupled from each other and are ready to be separated into individual functions in the next last step. But staying here we still have a very clear code easy to test and reason about and we don't need to adapt the pipeline onto this level of granularity. It's very easy to test a service built in this way. We write a Unit Test Suite for every action (exported function), an Integration Test Suite for the service API (index.js) and End-to-End Test Suite for the Gateway API facade. The whole stack could be found on GitHub. * Functions are sometimes called "nanoservices" as they are smaller than microservices. Actually, I don't even like the term "microservice" because it confuses people regarding its size ("How small should a microservice be? "), so I don't like to develop this terminology on in the same manner.